I recently finished reading Dambisa Moyo's book, Dead Aid (2009). Overall I'd call it a success in its overall goal: demonstrating how foreign aid to Africa has failed to improve living standards, and showing an alternate path open to African countries. Put briefly, Moyo says Western nations should cut off aid to African governments and instead engage in foreign direct investment, much like China has been doing in recent years. African states should go to the bond markets when they need funding, instead of asking for charitable aid or "loans" they have no real intention to repay. Well, why haven't they wanted to? Many African leaders are corrupt, but there is surely a gain to be made by a bold politician who pushes for his/her country's independence from outside assistance. Moyo goes on to explain, "To appreciate the economic prospects in a non-aid environment, however, requires a long-term and selfless vision, and not the myopia so many policymakers (at home and abroad) are afflicted with today." (148) Intuitively I can accept that many politicians are venal and short-sighted, but to say every aid-receiving leader on the African continent has been short-sighted for the last 60 years stretches credibility. While some researchers blame the methods of aid distribution, a more interesting approach (to me) is looking at the internal politics of aid-receiving countries. An article by professors Coyne and Leeson (2007) explains how internal reform can be stalled with a "Reformer's Dilemma" model (a variant of the Prisoner's Dilemma). Loosely speaking, it argues that demanding policy reforms in exchange for aid flows will only work once the dilemma has been resolved, so political agents will "own" the policy and use it for the public good rather than catering to special interests. The solution Leeson and Coyne propose for this dilemma is a free media, which allows citizens to better monitor their government. In the context of refusing aid, however, the role of media is somewhat different. Currently, the news media helps build the case for aid, and keeping the Western public aware of desperate needs coming from African countries. The free, Western media currently helps to keep aid flows going to Africa, while doing comparatively little to assess corruption or the overall effectiveness of the aid strategy. 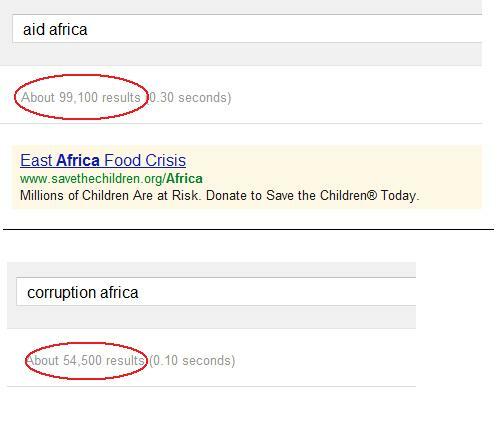 A quick Google News search finds twice as many references to "aid Africa" (as well as an advertised link) compared to "corruption Africa". A tiny example, but illustrative. 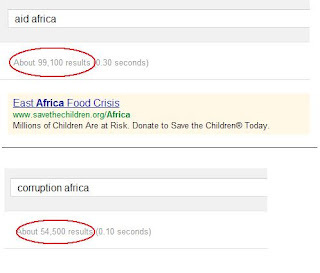 Aid distribution is big business and the media is currently part of the industry. Taking Dambisa Moyo seriously, a first-best solution would be for Western governments to cut off government-to-government aid to Africa. A second-best solution would be for African leaders to refuse to accept that aid for the long-term good of their people. However, economic logic suggests that this second-best option will not be exercised until the media's treatment of foreign aid fundamentally changes.